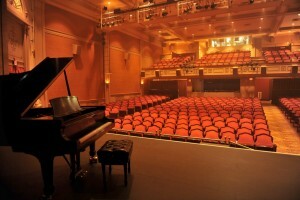 The WHBPAC, a former 1932 movie house, was renovated and restored in 1997-98 and since that time a host of world renowned artists have graced the stage of this intimate 425 seat theatre. The quaint seaside Village of Westhampton Beach provides ample parking for touring buses and trucks. The auditorium has been acoustically treated for optimal sound, and there are absolutely no bad seats. The theatre houses state of the art sound and lights that meet and surpass the requirements of most touring artists. Clean and comfortable dressing rooms provide showers and private facilities, as well as lighted and mirrored dressing tables. Catering from local vendors is top notch. Please review our tech specs below. For additional information, please contact us. We look forward to being your host! Take EXIT 63 SOUTH and Merge onto OLD RIVERHEAD RD. Upon reaching the ROUNDABOUT, take road towards BEACH (POTUNK LANE). Continue SOUTH and make the second LEFT onto MAIN STREET. From MAIN STREET take your first LEFT onto SUNSET AVENUE.